You are currently browsing the category archive for the ‘talks’ category. One of my distinct memories from elementary school is going to “library class” to learn about the Dewey decimal classification and how to use a card catalog to find books. Searching for books efficiently was possible because cards in the catalog were sorted lexicographically. It didn’t occur to me at the time, but the system required authors of books to be totally ordered. Without an ordering of authors in a book with multiple authors, there would be no way to decide where to place the card for the book in a catalog searchable by author. The practice of ordering authors on publications is evident in the oldest printed texts and has persisted to this day. I have never thought that it could be any other way. However this past Wednesday I was visiting the University of Washington to deliver a seminar, and among the highlights of the visit was my meeting with the graduate students. I met 12 for lunch and two more came for dinner. Meeting with students is always my favorite part of a visit to a university. They have original and creative ideas, and most importantly, are not bound in their thought by archaic tradition. They frequently don’t know what one is supposed to think and how one is supposed to say it. They just think and speak! One of the students I met on Wednesday was Vanessa Gray, a student of Doug Fowler, who in a conversation on authorship practices suggested to me the radical and brilliant idea that papers should be published without an ordering of authors. Many journals now have a section called “Author contributions” where roles of individuals in collaborative projects can be described (many journals now require such descriptions). So why bother ordering the authors for a list underneath the title? As far as indexing and searching goes, Google and other search engines require only a set of authors, and not a specific ordering. I agree with Vanessa that ending author ordering on publications would greatly improve fairness in the biological sciences, where many current projects involve complex assemblies of teams with complementary skills. “First authorship” is not well-defined when one author performed a large number of difficult experiments, and another developed novel algorithms and wrote complex software for analyzing the experiments. Similarly, “last authorship” fails as a concept when students are co-advised, or one principal investigator provides substantial funding on a project, while another is participating in doing the work. And recently, large consortium projects have completely destroyed any meaning of “author” by having hundreds, or even thousands of authors on projects. Even when there are relatively few authors people rarely credit anyone except the first and last authors, even if others did substantial work. In the recent ENCODE paper published in PNAS with 30 authors, it appears to me from the responses to my previous blog post about the paper that the 5th and 6th authors did a lot (majority?) of the work in putting together figures and results, yet I suspect the “credit” for the paper will go to the first author (the flip side in that case is that the first author is where blame is assigned as well). If every author thinks that X should be ordered before Y, then the author list should have X placed before Y. For a fixed list of voting preferences regarding the ordering of X vs. Y, the ordering between X and Y in the author list will not depend on the ordering of other pairs such as X and Z, Y and Z, or Z and W.
There is no “dictator”, i.e. no single author possesses the power to determine the author ordering. Authors frequently have differing opinions about the impact of their own contribution to a publication, and therefore their preferences (votes) for author ordering are discordant. This means that any system for ordering authors will not satisfy everyone’s preferences, and in the sense of Arrow’s impossibility theorem will be unfair. One way around Arrow’s impossibility theorem is to specify authorship order without regard to authors’ preferences, for example by always ordering authors alphabetically (the Hardy-Littlewood rule). This method, usually the one used in the mathematical sciences, is also fraught with problems. Of course, listing author contributions for what they are is not entirely trivial. For example, different authors may have conflicting views about what it means to have “written the text of the paper”. But using words to describe contributions allow for much more detail about what each author did, and allows for nuanced contributions to be described (e.g., John and Jane were in the room when the initial idea for the project was discussed, but did not contribute anything afterwards). To summarize, in the modern era of electronic publishing ordering of authors is unnecessary, and if it is unnecessary, then why confront Arrow’s theorem and inevitably produce orderings unfairly? Publications should just explain the author contributions. Time to end ordered authorship. 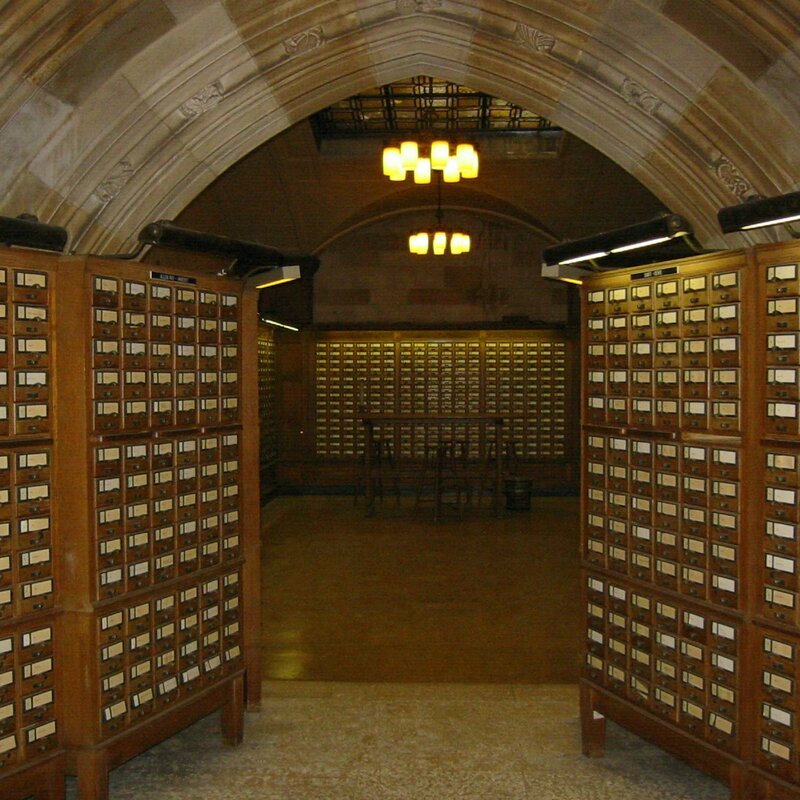 The card catalog at Yale University’s Sterling Memorial Library (from Wikipedia). I visited Duke’s mathematics department yesterday to give a talk in the mathematical biology seminar. After an interesting day meeting many mathematicians and (computational) biologists, I had an excellent dinner with Jonathan Mattingly, Sayan Mukherjee, Michael Reed and David Schaeffer. During dinner conversation, the topic of probability theory (and how to teach it) came up, and in particular Buffon’s needle problem. Suppose we have a floor made of parallel strips of wood, each the same width, and we drop a needle onto the floor. What is the probability that the needle will lie across a line between two strips? The appearance of in the denominator turns the problem into a Monte Carlo technique for estimating : simply simulate random needle tosses and count crossings. Let denote the expected number of crossings when a needle of length is thrown on the floor. Now consider two needles, one of length and the other , attached to each other end to end (possibly at some angle). If is a random variable describing the number of crossings of the first needle, and of the second, its certainly the case that and are dependent, but because expectation is linear, it is the case that . In other words, the total number of crossings is, in expectation, . Buffon’s needle problem: what is the probability that a needle of length crosses a line? 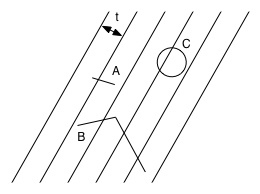 (A) A short needle being thrown at random on a floor with parallel lines. (B) Two connected needles. The expected number of crossings is proportional to the sum of their lengths. (C) A circle of diameter t always crosses exactly two lines. and the expected number of crossings of a needle of length l is . If , the number of crossings is either 0 or 1, so the expected number of crossings is, by definition of expectation, equal to the probability of a single crossing. This solves Buffon’s problem no calculus required! The linearity of expectation appears elementary at first glance. The proof is simple, and it is one of the first “facts” learned in statistics– I taught it to my math 10 students last week. However the apparent simplicity masks its depth and utility; the above example is cute, and one of my favorites, but linearity of expectation is useful in many settings. For example I recently saw an interesting application in an arXiv preprint by Anand Bhaskar, Andy Clark and Yun Song on “Distortion of genealogical properties when the sample is very large“. The paper addresses an important question, namely the suitability of the coalescent as an approximation to discrete time random mating models, when sample sizes are large. This is an important question, because population sequencing is starting to involve hundreds of thousands, if not millions of individuals. The results of Bhaskar, Clark and Song are based on dynamic programming calculations of various genealogical quantities as inferred from the discrete time Wright-Fisher model. An example is the expected frequency spectrum for random samples of individuals from a population. By frequency spectrum, they mean, for each k, the expected number of polymorphic sites with k derived alleles and n-k ancestral alleles under an infinite-sites model of mutation in a sample of n individuals. Without going into details (see their equations (8),(9) and (10)), the point is that they are able to derive dynamic programming recursions because they are computing the expected frequencies, and the linearity of expectation is what allows for the derivation of the dynamic programming recursions. None of this has anything to do with my seminar, except for the fact that the expectation-maximization algorithm did make a brief appearance, as it frequently does in my lectures these days. I spoke mainly about some of the mathematics problems that arise in comparative transcriptomics, with a view towards a principled approach to comparing transcriptomes between cells, tissues, individuals and species. The Duke Chapel. 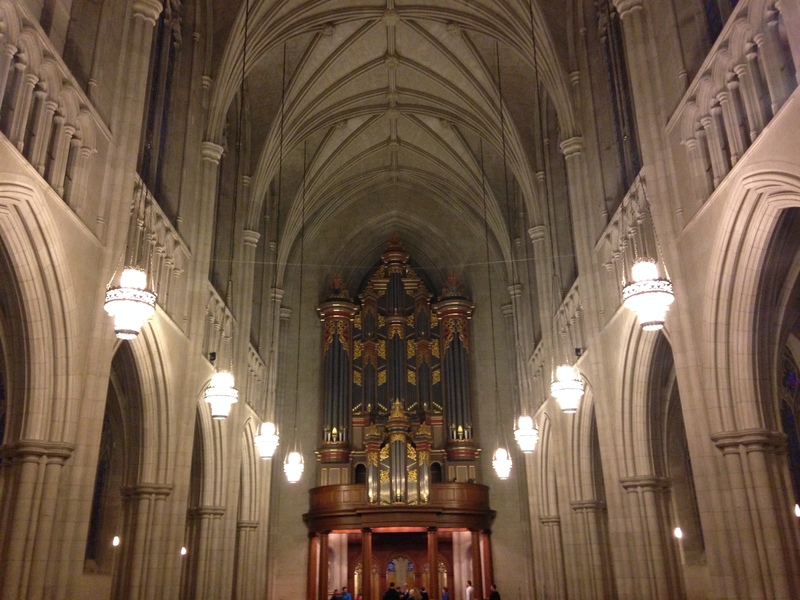 While I was inside someone was playing the organ, and as I stared at the ceiling, I could have sworn I was in Europe. Last Saturday I returned from Cold Spring Harbor Laboratories where I spoke at the Genome Informatics Meeting on Stories from the Supplement. On Monday I delivered the “Prestige Lecture” at a meeting of the Center for Science of Information on New Directions in the Science of Information and I started by talking about Cold Spring Harbor Laboratory (CSHL). That is because the Eugenics Record Office at CSHL is where Claude Shannon, famous father of information theory, wrapped up his Ph.D. in population genetics in 1939. The fact that Shannon did his Ph.D. in population genetics– his Ph.D. was titled “An Algebra for Theoretical Genetics“– is unknown to most information theorists and population geneticists. It is his masters thesis that is famous (for good reason– it can be said to have started the digital revolution), and his paper in 1948 that founded information theory. But his Ph.D. thesis was impressive in its own right: its contents formed the beginning of my talk to the information theorists, and I summarize the interesting story below. I learned about the details surrounding Shannon’s foray into biology from a wonderful final project paper written for the class The Structure of Engineering Revolutions in the Fall of 2001: Eugene Chiu, Jocelyn Lin, Brok Mcferron, Noshirwan Petigara, Satwiksai Seshasai, Mathematical Theory of Claude Shannon. In 1939, Shannon’s advisor, Vannevar Bush, sent him to study genetics with Barbara Burks at the Eugenics Record Office at Cold Spring Harbor. That’s right, the Eugenics office was located at Cold Spring Harbor from 1910 until 1939, when it was closed down as a result of Nazi eugenics. Fortunately, Shannon was not very interested in the practical aspects of eugenics, and more focused on the theoretical aspects of genetics. The notation refers to genotype frequencies in a diploid population. The indices refer to alleles at three loci on one haplotype, and at the same loci on the other haplotype. The variables correspond to recombination crossover probabilities. is the probability of an even number of crossovers between both the 1st and 2nd loci, and the 2nd and 3rd loci. is the probability of an even number of crossovers between the 1st and 2nd loci but an odd number of crossovers between the 2nd and 3rd loci, and so on. Finally, the dot notation in the represents summation over the index (these days one might use a ). The result is a formula for the population genotype frequencies after generations. 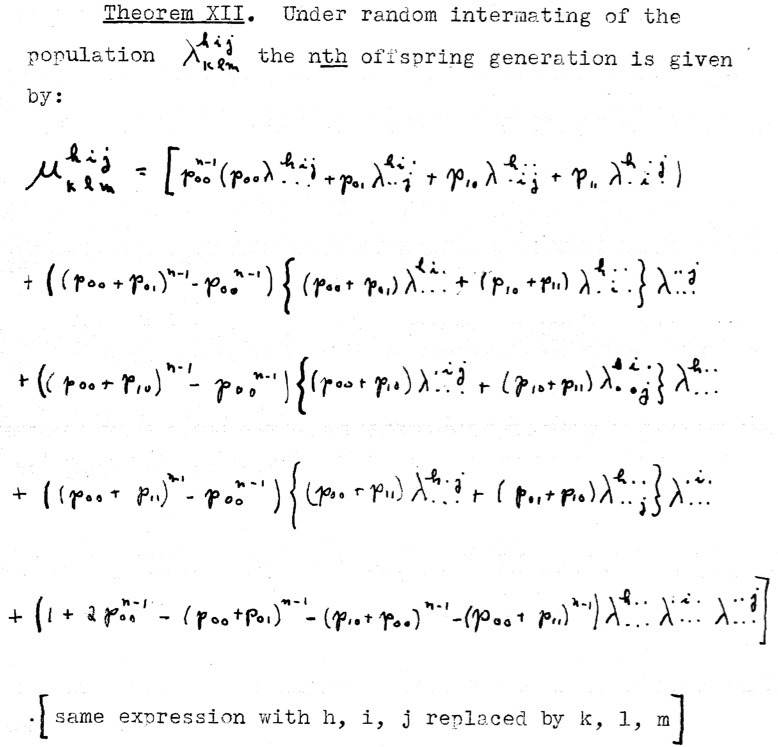 The derivation involves elementary combinatorics, specifically induction, but it is an interesting result and at the time was not something population geneticists had worked out. What I find impressive about it is that Shannon, apparently on his own, mastered the basic principles of (population) genetics of his time, and performed a calculation that is quite similar to many that are relevant in population genetics today. Bush wrote about Shannon “At the time that I suggested that he try his queer algebra on this subject, he did not even know what the words meant… “. Why did Shannon not pursue a career in population genetics? The Eugenics Record Office closed shortly after he left and Bush discouraged him from continuing in the field, telling him that “few scientists are ever able to apply creatively a new and unconventional method furnished by some one else – at least of their own generation”. Thus, despite encouragement from a number of statisticians and geneticists that his work was novel and of interest, Shannon returned to electrical engineering. Shortly thereafter, the world got information theory. Of course today population genetics has data, tons of it, and many interesting problems, including some that I think require insights and ideas from information theory. My Prestige Lecture was aimed at encouraging information theorists to return to their Shannon roots, and redirect their focus towards biology. I have been working with information theorist David Tse (academic grandson of Shannon) for the past year on de novo RNA-Seq assembly (a talk on our joint work with postdoc Sreeram Kannan was presented by Sreeram at the Genome Informatics meeting), and I believe the engagement of information theorists in biology would be of great benefit to both fields; in terms of biology, I see many applications of information theory beyond population genetics. Some back-and-forth has already started. Recently there have been some interesting papers using information theory to study genome signatures and compression, but I believe that there are many other fruitful avenues for collaboration. David and Sreeram were the only information theorists at CSHL last week (I think), but I hope that there will be many more at the 2014 meeting in Cambridge, UK! The beach at Cold Spring Harbor. I took the photo on November 1st before my Genome Informatics keynote. I have just returned from the Genome Informatics 2013 meeting at CSHL. Jennifer Harrow, Michael Schatz and James Taylor organized a fantastic event that I thoroughly enjoyed. A. Roberts and L. Pachter, Streaming algorithms for fragment assignment, Nature Methods 10 (2013), p 71—73. After a thorough and productive review process, deftly handled by editor Tal Nawy whose work on our behalf greatly improved the quality of the paper, we were sent an email from the journal shortly before publication stating that “If the Online Methods section contains more than 10 equations, move the equation-heavy portions to a separate Supplementary Note“. This requirement made it essentially impossible to properly explain our model and method in the paper. After publishing lengthy supplements for the Cufflinks papers (see below) that I feel were poorly reviewed to the detriment of the paper, I decided it was time to talk about this issue in public. Transcript assembly and quantification by RNA-Seq reveals unannotated transcripts and isoform switching during cell differentiation, Nature Biotechnology 28, (2010), p 511–515. Differential analysis of gene regulation at transcript resolution with RNA-seq, Nature Biotechnology, 31 (2012), p 46–53. Methods in the supplement frequently contain ideas that transcend the specifics of the paper. These ideas can be valuable in the long run, but when they are in the supplement it is harder to identify what they are and to appreciate their significance. Supplements frequently contain errors (my own included). These errors make it difficult for others to understand the methods and implement them independently. In RNA-Seq specifically, there are a number of methodological issues buried in the supplements of various papers that have caused confusion in the field. The constant push of methods to supplements is part of a general trend to overemphasize the importance of data while minimizing the relevance of methods. In this plot each point represents the accuracy for the samples when quantified independently (black), or by our method (red/blue). The difference between red and blue has to do with a technical choice in the method that I explained in the talk. , which is obviously not correct (the answer is ). A key point I made is that even though it might seem that the wrong answer is at least close to the correct answer, in practice, on real data, the differences can be significant. I showed an analysis done by Cole Trapnell using an extensive dataset generated in the Rinn lab for the Cufflinks 2 paper that makes this point. I talked about the different units currently being used for RNA-Seq quantification, such as CPM, RPKM, FPKM and TPM (all of them appeared in various talks during the meeting). I discussed the history of the units, and why they were chosen, and argued in favor of simply using the relative abundance estimates (perhaps normalized by a constant factor, as in TPM). This point of view was first advocated by Bo Li and Colin Dewey in their RSEM paper, and I hope the community will adopt their point of view. My penultimate slide showed this world map of high-throughput sequencers. I think this is a very cool map, as it shows (by proxy) the extraordinary extent of sequencing going on worldwide. However it is yet another example of a focus on data, and data generation, in genomics. Data is of course, very important, but I showed another map for methods, that illustrates a very different thing: the extent of computational biology going on around the world. 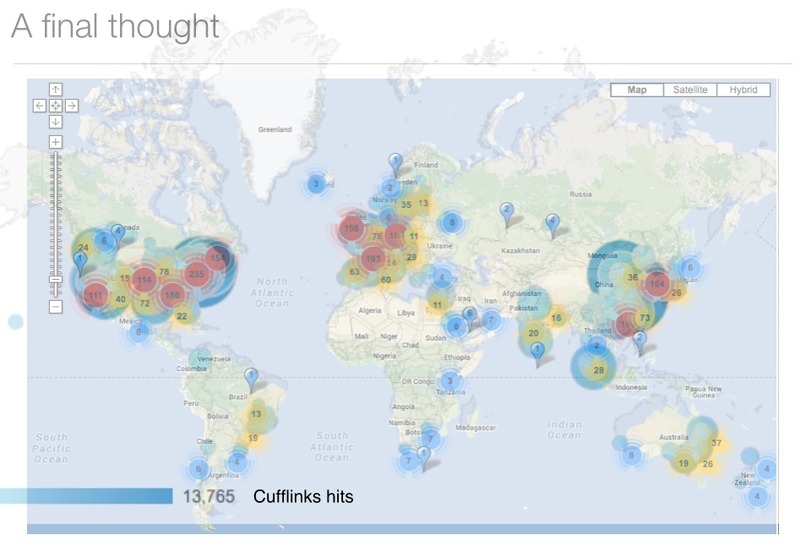 The methods map is made from visits to the Cufflinks website. I mashed it with the sequencer map to make the case that data and methods go hand-in-hand. Sequencers of the world and users of Cufflinks. When the organizers of ISMB 2013 kindly invited me to give a keynote presentation this year, I decided to use the opportunity to survey “sequence census” methods. These are functional genomics assays based on high throughput sequencing. It has become customary to append the suffix “-Seq” to such assays (e.g. RNA-Seq), and I therefore prefer the term *Seq where the * denotes a wildcard. The starting point for preparing the talk was a molecular biology seminar I organized in the Spring of 2010, where we discussed new high-throughput sequencing based assays with a focus on the diverse range of applications being explored. At the time I had performed a brief literature search to find *Seq papers for students to present, and this was helpful as a starting point for building a more complete bibliography for my talk. Finding *Seq assays is not easy- there is no central repository for them- but after some work I put together a (likely incomplete) bibliography that is appended to the end of the post. 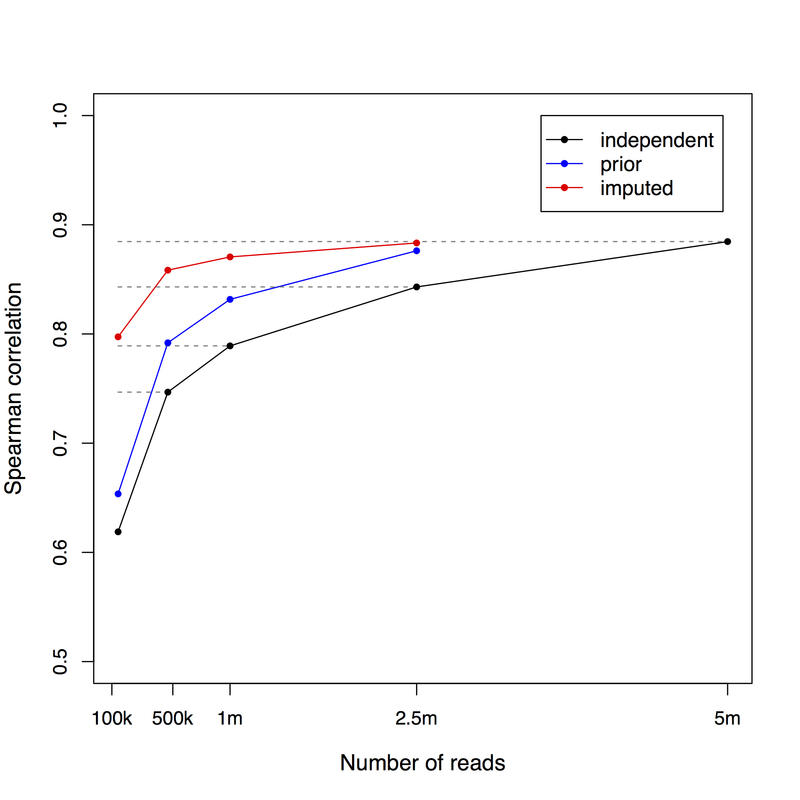 Update: I’ve created a page for actively maintaining a bibliography of *Seq assays. The goal for my talk was to distill what appears to be a plethora of complex and seemingly unrelated experiments (see, e.g., Drukier et al. on the *Seq list) into a descriptive framework useful for thinking about their commonalities and differences. I came up with this cartoonish figure that I briefly explain in the remainder of this post. In future posts I plan to review in more detail some of these papers and the research they have enabled. A typical assay first involves thinking of a (molecular) measurement to be made. 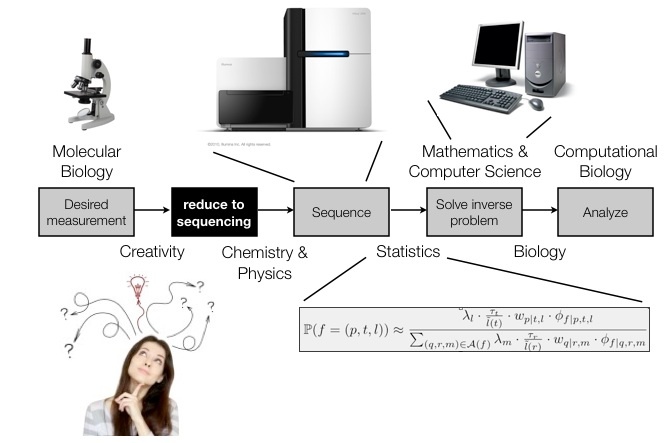 The problem of making the measurement is then “reduced” (in the computer science sense of the word) to sequencing. This means that the measurement will be inferred from sequencing bits of DNA from “target” sequences (created during the reduction), and then counting the resulting fragments. It is important to keep in mind that the small fragments of DNA are sampled randomly from the targets, but the sampling may not be uniform.